What's immediately obvious is the new models are covered in two-tone fabric that's a bit shinier than before and is woven tighter for improved endurance. There's more of it, too. The rubbery band spanning the length of the device is thinner this time around, and less rubber equals more sound-emitting surface area. There's now a fabric loop for all your hanging needs, Bluetooth range has increased and in a simple yet sensible change, the micro-USB charging ports have moved from underneath the speaker to the bottom of the rubber strip. This means they can stay standing while being refueled and, though the port itself is already waterproofed, a cover flap provides some extra protection. What's more, both models have an improved dust- and waterproof rating of IP67. 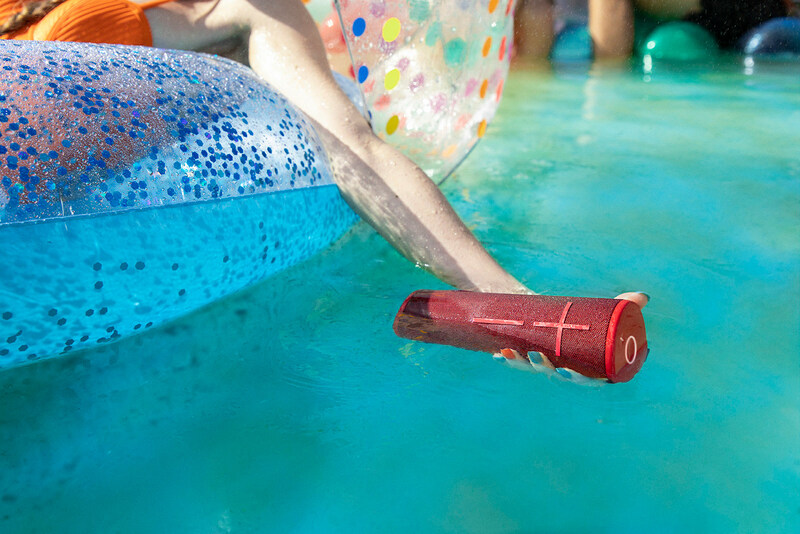 Ultimate Ears has actually worked on balancing the two speakers — the Megaboom 3, in particular — so as much surface area as possible floats above water. Being able to throw it in the pool and forget about it is basically a feature now. 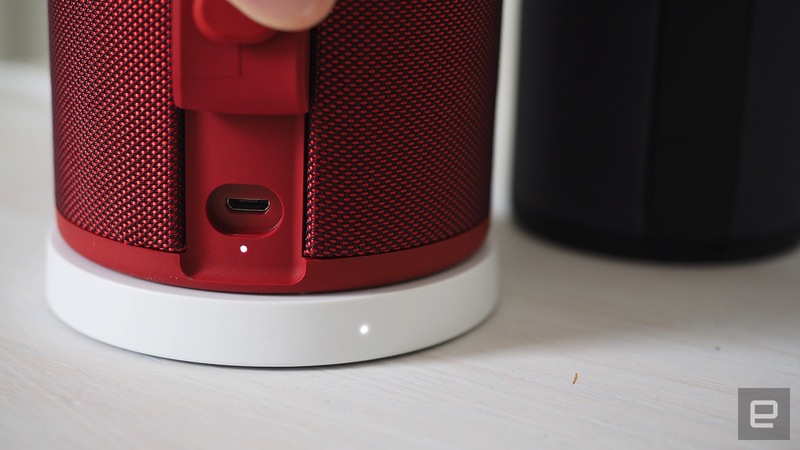 Those familiar with the brand will be pleased to hear that both new models work with the existing $40/£35 Power Up charging base, and linking multiple speakers together through the redesigned Ultimate Ears app -- the PartyUp feature, as it's known -- is possible regardless of generation. 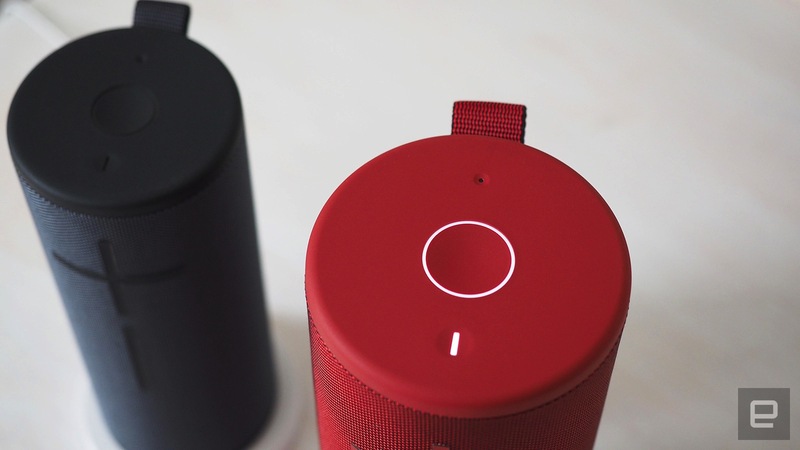 Much of the actual internal speaker hardware remains unchanged, but the Megaboom 3 has a tweaked bass element to make for a punchier lower-end. The only other significant change is a "magic button" that sits on top of both devices. This works a lot like the button you'll find on most pairs of headphones: One tap plays or pauses music and a double-tap skips the current track. You can already do that on existing Ultimate Ears speakers, so that's not exactly magic. It has another function, though. Press the button, and it'll automatically start playing a playlist. Not what you wanted? Press it again and it'll switch to the next one. This has pretty limited utility as it stands, however, because you have to assign playlists to this button within the Ultimate Ears app. And this is only compatible with Apple Music on iOS and Deezer on Android. If you're subscribed to a different service, this feature is useless to you, though the plan is to partner with more streaming services in the near future. The best news isn't really this magic button, though, but the lower entry price. 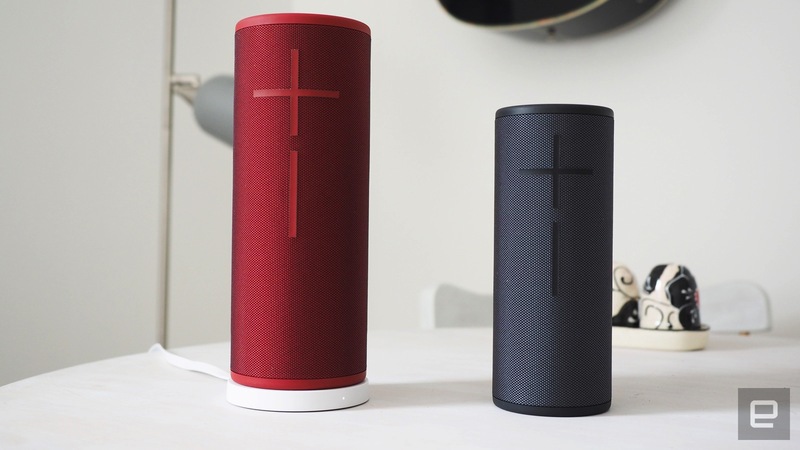 The Boom 3 and Megaboom 3 will be available in the US, Europe and Asia in September for $150/£130 and $200/£170, respectively, which is significantly cheaper than the launch prices of previous speakers in this line. Blue, black, purple and red versions are in the initial batch, while lighter and darker blue colors will be exclusive to Apple stores. Later in the year, Ultimate Ears plans to offer a green model, following up with pink in early 2019 -- and now the rubber strip is neater than before, the longer-term goal is to put that extra fabric to good use with some outlandish special editions.